My trip up to Prince George and Quesnel for the family reunion was wonderful and waaaay too short. My aunt and I drove up from Vancouver in her luxury car the day after school ended. I love that drive, seeing BC in all it's glory. Once we arrived at Quesnel in the evening, I got to meet all the Doll family and there were a lot of them! We laughed, we talked, and we ate a lot of great food. There was also a lot of games of cribbage, of which I won two games against my 94 year old Great Aunt, who is smart and sharp as a whip. She would count my hand before I could even begin! Winning that game with a 21 hand brought me back memories of my first game with my Great Grandpa Doll when I was nine. I won against him too with a 24 hand (which is very high in the game of crib). The reunion took place at my cousin's house in Quesnel, which is a quaint little town about an hour away from Prince George. Her garden was sublime. 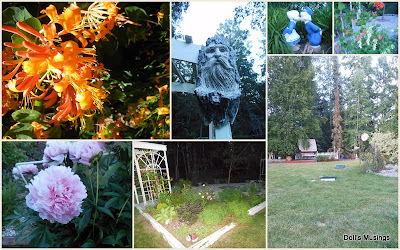 I loved walking around her garden and took lots of pictures. It was great fun hanging out with my brother and sister in the town of Quesnel. I finally got to walk over the walking bridge!! This is a bridge we have passed by in our travels many, many times before but we were never allowed to stop and take a walk. It was always...get to Vancouver with no stopping! So thankfully, with this trip, I managed to see a number of sites I've always wanted to see since I was a little girl. Did I mention it was boiling out? Oh it was so hot! I loved dipping my feet in the cool river. It felt wonderful! The rest of the week I helped out my mom and Dad sort things, visit my Grandma, have more bbq's and take a wonderful trip to Purden lake, where I was eaten up by flies and mosquitos...blech...hate the bugs in the summertime. The bugs LOVE me I'm telling you! Here's some more photos of my trip. The first few are of my old elementary school. My brother I took a walk down memory lane. The road trip home....My aunt and I have always wanted to take the trolley across the deepest, steepest, craziest part of the Fraser River since we were both kids. The place is called Hell's Gate and is probably the coolest spot, or should I say hottest, in BC. Unfortunately, we got there an hour late and the place was closed....I was so sad. Hopefully, one day, I will get a chance to go there again. We also stopped at Yale, a super small little town that had a flea market going on. I bought two vases and bargained with the lady. I love bargaining. I forgot to take photos of my vases, but here's a cool pic of the market. You never know what you can find along the highway from Prince George to Vancouver. Back at home, I had little Titus waiting for me and my lovely husband. Titus was super playful, as though he hadn't been played with all his life!! Just so this isn't a completely non-stitchy post, here's my minute progress on Hannah. I really didn't have much of a chance to stitch on her. I did start another design, a BBD, but it's for my friend's Christmas gift so I can't show you that one until much later. Hopefully, you enjoyed this post. I am sad and glad to be back at the same time! Glad to be home with the man and cat, but sad to say goodbye to my family. I'm happy to be reading all of your posts and cycling and doing all sorts of fun summer activities. My name was picked to win this SANQ from the lovely Vickie. She sent me some darling pins and a lovely note too. Thank you my dearest Vickie! You had yourself a bit of adventure.Thanks for sharing and loved the photos.Glad you had a good time. How fun and wonderful for you Anne. I am so glad you got to see your family. I am blessed to see my mom and brothers monthly. I love that Stellar Jay picture, really neat. Wow beautiful photos ..glad you had a fun time.. Sounds like a fantastic trip....beautiful photos too! What a great trip! I enjoyed reading about it and seeing all the pics. Your Hannah is looking gorgeous too! I bet Titus was happy to have you back home! Oh I loved seeing all the pictures of your trip Anne. Looks like you had a fantastic time. Great progress on your stitching. Glad you had a good time. The sampler is coming along very nicely - it's just lovely. What a truly lovely wonderful adventure you had with your family. You certainly packed in lots of sights and your pictures are great. So happy for you to have had such a great trip. Beautiful progress on Hannah, and I love those very special gifts from Vickie! Blessings & Hugs, Dear Anne! What a wonderful trip!! Thanks for sharing! photos! It's great to have fun time with family! Gorgeous pics, thank you for sharing! Great picture show and I enjoyed hearing about your family reunion. Welcome home! You know we've passed by Hell's Gate loads of time but always on the way someplace so we've never been on it neither! Funny. Looks like a wonderful family time. I enjoyed seeing so many wonderful places. Fabulous pictures, Anne! I'm glad you enjoyed your time with family. It's nice that you could take the time to enjoy some new places too. What a sweetie Titus is. :) Hannah is looking pretty! I loved traveling with you! It looks like you had a wonderful time. What does Titus thin of Spaulding hanging out in your suitcase? It was so interesting to do this trip with you. Thanks for all the exciting pictures. What a great way to get to know regions and scenery that I will probably never see in real life. And it's also exciting to see Hannah grow. hahahah Fun pictures in the middle :D LOL!!! How nice to spend time with your family, Anne--looks like you and your siblings really enjoyed yourselves! Ha ha--Spalding wanted to go visit his cousin Titus, I bet :) Too cute!! It looks like you had a wonderful time with your family! Your stitching is beautiful. Love all the pictures. Great progress on Hannah. Kitty pictures are always good for a smile. Stay cool. Beautiful pictures and post. From the reading, it is evident you had a really wonderful time and I really enjoyed reading about your trip too. I really like the photo with the view of the lake (the one with the chairs with your brother. I so enjoyed going on your trip with you. So much fun. I am catching up on reading my blogs, so this is a late comment, but what a great trip you had! I love family reunions. Unfortunately my family live on the west coast and I am on the east, so it will be a while before I drive out there (cannot fly)--need lots of time, so we are talking when I ever RETIRE!! Great pictures of the trip and your family. I enjoy posts like that. Thanks for sharing! Hugs!